This entry was posted in 3D Cards, Any Occasion Cards, Cards, Gift Packaging, Gift Packaging, Other Interactive Cards, Papercraft, Slider Cards, Thank You Cards, Thinking of You Cards and tagged Gift Boxes, gift set, Gift Wrapping, Lined envelope, Neat & Tangled Doily Envelope, Neat & Tangled Sweet Treats, Neat & Tangled Truck, neatandtangled, paper truck, shaker card, sssmchallenge, ssswchallenge, USPS paper truck gift box by dannscraftingwhims. Bookmark the permalink. Wow! These are fantastic. I especially love the delivery truck you did. Looks so real. 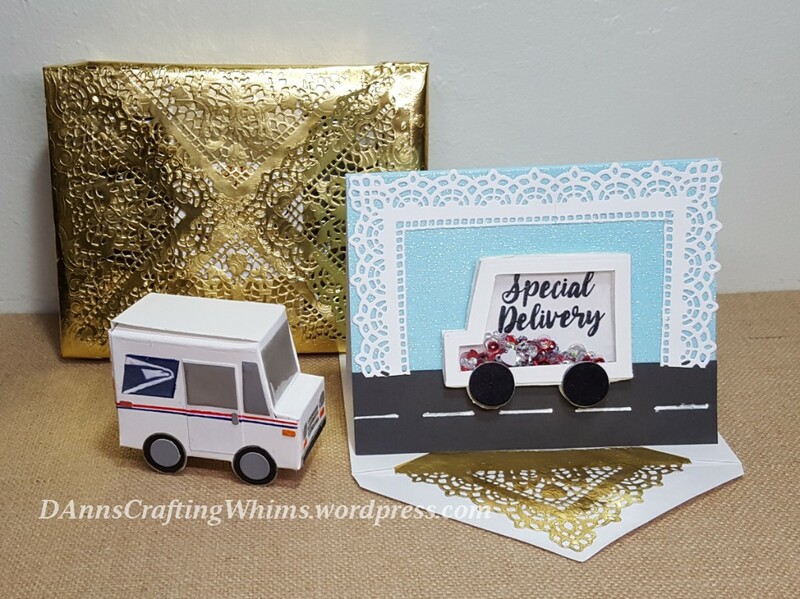 That little mail truck is just too cute! Thanks for linking up to Cropstop with this! OH MY GOSH!! 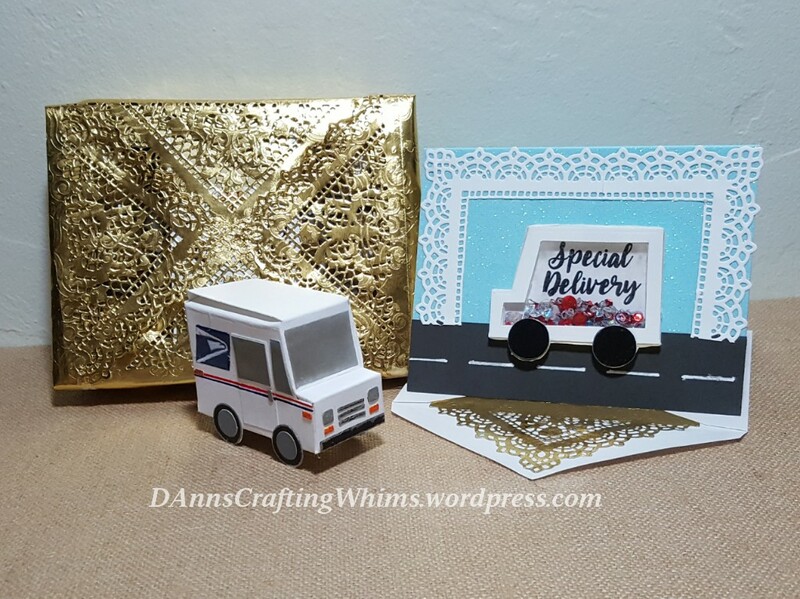 This little postal truck is so adorable! I love seeing miniatures of familiar objects, and this is probably the cutest thing I’ve seen in a long while. I need to go check out that die to see what it’s all about, but you definitely need to do a UPS truck next, haha! 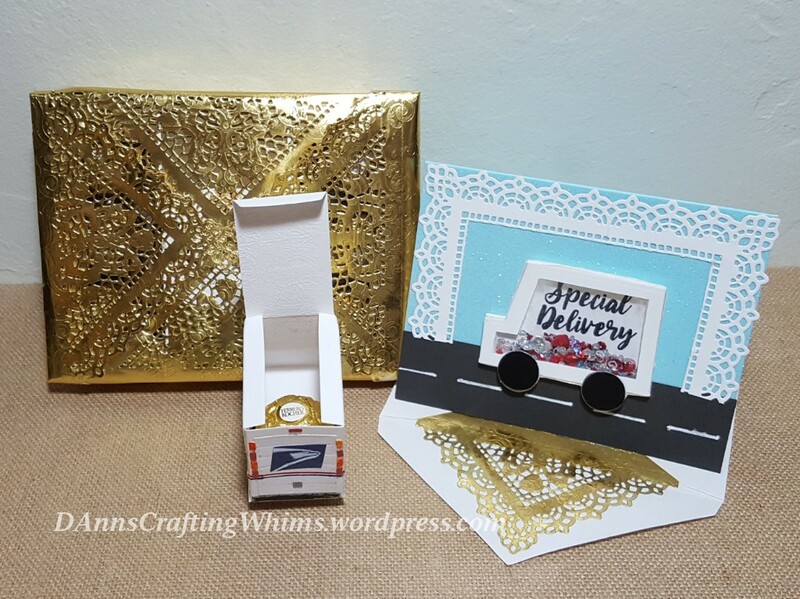 Just had to add that your elegant doily envelope and fun shaker card are the topping on the cake. Did you draw the logo and details on that mail truck?? I’d love to imagine the look on her face when you gave it to her!